نجاتی کلاته, علی, سیاه کوهی, حمیدرضا, میرزائی, محمود, حسین زاده گویا, ناصر. (769). وارون غیرخطی داده‌های مغناطیسی با استفاده از روش گرادیان زیرفضا. مجله ژئوفیزیک ایران, 4(2), 13-31. علی نجاتی کلاته; حمیدرضا سیاه کوهی; محمود میرزائی; ناصر حسین زاده گویا. "وارون غیرخطی داده‌های مغناطیسی با استفاده از روش گرادیان زیرفضا". مجله ژئوفیزیک ایران, 4, 2, 769, 13-31. نجاتی کلاته, علی, سیاه کوهی, حمیدرضا, میرزائی, محمود, حسین زاده گویا, ناصر. (769). 'وارون غیرخطی داده‌های مغناطیسی با استفاده از روش گرادیان زیرفضا', مجله ژئوفیزیک ایران, 4(2), pp. 13-31. نجاتی کلاته, علی, سیاه کوهی, حمیدرضا, میرزائی, محمود, حسین زاده گویا, ناصر. وارون غیرخطی داده‌های مغناطیسی با استفاده از روش گرادیان زیرفضا. 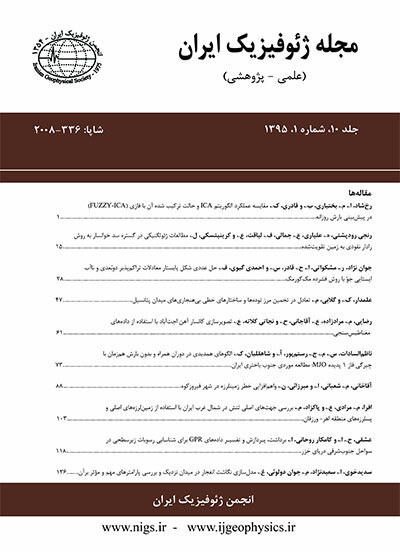 مجله ژئوفیزیک ایران, 769; 4(2): 13-31. این مقاله یک روش پایدار، موثر وقابل انعطاف برای حل مسائل معکوس غیر خطی را برای مدل‌سازی معکوس داده‌های مغناطیسی معرفی می‌کند. روش تکراری عرضه شده در این مقاله به‌‌خوبی با مسائل معکوس غیر خطی با حجم زیاد پارامترهای مدل، سازگار است. روش گرادیان زیرفضا از پارامترسازی استفاده می‌کند که در آن عمق بالایی بلوک‌ها ثابت و عمق پایینی آنها متغییر است. در این روش پارامترهای مدل با توجه به بعد ابعادی متغییر، در زیرفضاهای مجزا رده‌بندی می‌شوند. روش عرضه شده روشی مبتنی بر تکرارهای متوالی است که در هر تکرار، تغییرات پارامترهای مدل در یک زیرفضای Pبُعدی از فضای Mبُعدی پارامترها به‌دست می‌آید ( که با استفاده از این تغییرات، مدل اولیه به‌‌روز خواهد شد). بردارهای اساسی و تشکیل دهنده این زیرفضای Pبُعدی از آنالیز تجزیه به مقادیر منفرد ماتریس مشتقات دوم پارامترهای مدل استخراج می شود. از این بردارهای پایه ماتریس تصویر از فضای Mبُعدی پارامترهای مدل به زیرفضای Pبُعدی از پارامترهای مدل استفاده می شود. این روش در وارون‌سازی داده‌هایی با درصد زیاد نوفه، نتایج خوبی را نشان داده است. همچنین وارون‌‌سازی با روش گرادیان زیرفضا با وارون‌‌سازی به روش مارکوارت-لونبرگ که روشی متداول ومرسوم در وارون‌‌سازی‌های مسائل غیر خطی است، مقایسه شده است. نتایج نشان می‌دهند که روش گرادیان زیرفضا علاوه بر همگرایی زمانی با سرعت بیشتر، دارای پایداری قابلِ‌‌ملاحظه‌ای نسبت به روش ذکر شده است. به منظور نشان دادن قابلیت‌های روش عرضه شده درموارد عملی ژئوفیزیک، وارون‌سازی داده‌های واقعی برداشت شده در ناحیه مغان در راستای یک نیم‌رخ صورت گرفته است که نتایج، همخوانی خوبی با نتایج حاصل از حفاری در این منطقه دارد. Inverse theory was developed by scientists and has been used in different scientific applications, such as geophysical tomography, image enhancement, curve fitting and determination of earth structure from geophysical data. Inverse theory provides mathematical techniques to obtain useful information about measurements (data). The information resulting from inversion usually reveals some specific properties of the geological structures, called model parameters. Inverse theory, in contrast to forward theory, which predicts results of measurements on the basis of a suggested model relevant to the problem, uses models that are adjusted and estimates the model parameters by using the data and some general principles. It should be noted that inverse theory provides information about unknown model parameters directly using measured data. In contrast to forward theory, inverse theory doesn't provide a basis for the model itself. Recently, considerable effort has been devoted to the explanation of gravity and magnetic anomalies by employing data inversion in the spatial domain. Three major types of gravity and magnetic data inversion are discussed in geophysical literature. The first is "Inverting data for solving both physical and shape parameters". In this case, the inverse problem is completely non-unique. The non-uniqueness of the problem is visible in the two-dimensional section as a large number of well-defined local minima, some of which are distinguished as unfeasible. In this class, unacceptable solutions can be confined by specifying some of the model parameters. The second type of gravity and magnetic data inversion is "Inverting data for solving physical parameters". In this approach, the earth is divided into a limited number of cells of fixed size with unknown physical parameters, such as density and magnetization. The non-uniqueness of the solution is evident and algorithms have been developed to produce a single model by minimizing an objective function. The third type of gravity and magnetic data inversion is "Inverting data for solving shape parameters". In this class, physical parameters are assumed to be known and nonlinear operators must be design to determine geometry of the geophysical sources. However, geophysical inversion methods are most effective when a linear operator is applied; thus, the problem is usually linearized about some initial model and the inverse problem is solved iteratively. This paper presents a robust, flexible and efficient algorithm to solve large scale non-linear inverse problems in geomagnetic surveys (the third type of gravity and magnetic data inversion). Considering the sensitivity of inverting magnetic data and the high level of noise in data acquisition, the inversion of magnetic data should be performed using advanced methods. These methods have high performance to handle noise data. The method is iterative, and at each iteration a perturbation of model parameters in a P-dimensional subspace of an M-dimensional model space are sought (the primary model is updated using perturbation values of the model parameters at each iteration). This style of iterative subspace procedure is well adapted to non-linear inverse problems with many parameters and can be successfully applied to a variety of geopotential problems. The gradient subspace algorithm utilizes a model of parameterization in which the depth of each block is described as an unknown parameter. Model parameters are allocated to separate subspaces on the basis of different physical dimensionality (in this case, model parameters have the same physical dimension). Basis vectors of P-dimensional subspace are extracted by the SVD of a Hessian matrix (the second derivation of model parameters). M-dimensional model space is projected onto P-dimensional subspace using basis vectors. If effective basis vectors are chosen for inversion procedures, the projected matrix is accurate with respect to original one. In new and small dimensions, inversion can be performed with great speed and is stable against noise. This procedure is very effective in accelerating convergence and obtaining a more accurate solution. Also, the inversion is robust with respect to data errors and poor initial estimations. The efficiency of the method is compared with one of the conventional methods of inversion of non-linear problems (Marquardt-Levenberg); the results show that the gradient subspace has fast and stable convergence in comparison to its performance in the conventional method. The practical effectiveness of this method is demonstrated by inversion of synthetic and real examples. The real magnetic data is acquired over the MOGHAN area, in the northwest of Iran. The results compared with those of seismic interpretation at the study area.